On a seasonally-adjusted basis, unemployment rose to 5.8 from a record low of 5.5 in December. The administration of Dilma Rousseff has recently taken steps to boost industry and curb the rise of the real, including currency controls and lower interest rates. 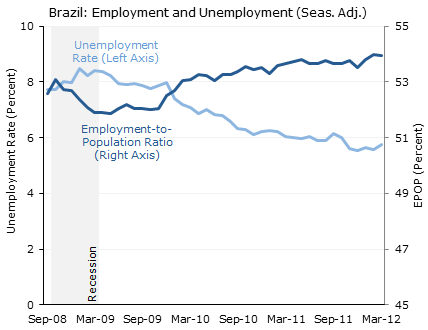 Brazil’s latest employment report shows evidence that these steps may be having their intended effect. From 2009 to 2011, post-recession job gains had been concentrated in business services and finance: in the last quarter of 2011, the sector accounted for nearly 90 percent of all new jobs. While one cannot infer a change of direction from one quarter’s data, today’s employment report shows a sharp reversal of this trend. 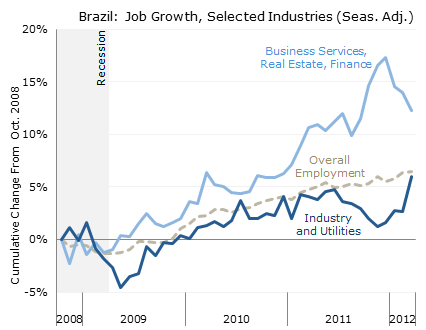 During the first quarter of 2012, jobs in industry and utilities have nearly eliminated their gap behind the overall labor market, while business services, real estate, and finance eliminated most of the jobs they gained in the last quarter of 2011. 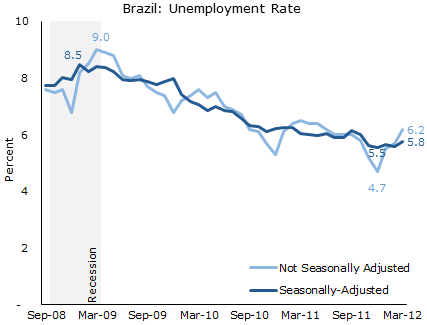 On its face, Brazil’s unemployment rate seems to have shot up: to 6.2 percent, its highest level since summer 2011. However, this is misleading for two reasons: first, the unemployment figures released by IBGE are not seasonally adjusted; the first quarter of each year usually has high unemployment and March is often the year’s peak. On a seasonally-adjusted basis, the rise in unemployment was much less severe: up to 5.8 percent from a record low of 5.5 in December, compared to the unadjusted rise to 6.2 percent from 4.7 percent in December. Secondly, some of the rise in the unemployment rate is due to a growth in the labor force, which since the recession had been growing more slowly than the working-age population as a whole. Meanwhile, the number of employed people rose, though at a slower rate than in recent months. The EPOP (employment-to-population ratio, or the share of the working-age population that is employed) was essentially flat in March, falling from 54.0 to 53.9 percent. 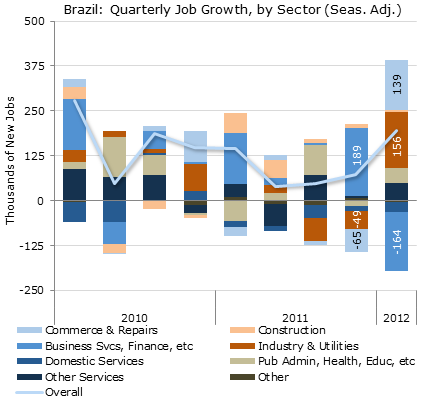 More notable is the distribution of jobs among sectors. Between 2010 and 2011, over half of all new jobs were created in business services, real estate, and finance, while jobs in industry and utilities lagged behind overall employment. The last quarter has seen a dramatic reversal of this trend. Again, one must exercise caution in interpreting one quarter’s data – it will take some time to see if this really represents the beginning of a change in the composition of new employment. But jobs in industry and utilities have now nearly caught up with the rest of the labor market, and business services have shed about half of the jobs they picked up in 2011.